Some days I set the alarm clock for 4 AM and race out the door 30 minutes later, but I can’t manage that every day; not even every weekend day. Sunday, after two sleepless nights worrying about my dog who was trying to die on us — don’t worry. 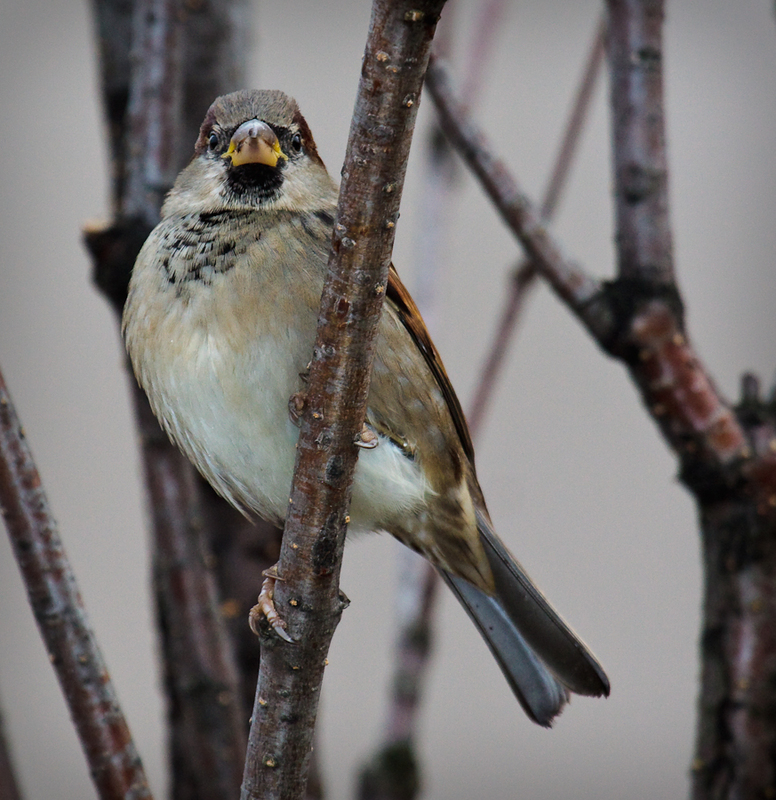 She’s fine now — and an all day trip to the Meadowlands with the Brooklyn Bird Club on Saturday, I slept in. I wasn’t sure what I was going to do on Sunday, maybe just a light walk around the park to play with a Canon 300 mm lens I rented, but by about 10 AM I was starting to recover and feeling a little more ambitious. At the same time, my legs were still a little sore from the previous day’s trip saw wasn’t sure walking around the park with a couple of kilos of camera gear around my neck was the best idea. Instead I decided to grab a car and head out to Suffolk County to look for the Pink-footed Goose and the Barnacle Goose that have been reported there for the last couple of weeks. I decided to avoid the LIE and the BQE, and instead headed up Eastern Parkway to the Jackie Robinson, which took me to the Grand Central Pkwy and then the Northern State. An hour later I arrived at Kings Park High School where the geese have been reported to be feeding during the daytime. Indeed, there was a flock of about 100 or so Canada Geese on the field. However, no Barnacle Goose and no Pink-footed Goose. No problem. There were other locations to check. The next stop was Sunken Meadow State Park, a couple of miles away as the goose flies. This is where the geese were first found, and where they seemed to spend the evenings. Starting from the entrance to the park, I check every open field right up to the beach. There were another hundred or so Canadas grazing near the visitor center, but no Barnacle Goose and no Pink-footed Goose. I wandered out to the beach to see what might be there. There were the usual flocks of Ring-billed gulls, Herring Gulls, and the Great Black-backed gulls; and one late Semi-palmated Plover; but nothing too surprising. After half an hour on the beach, I walked back to the goose flock. 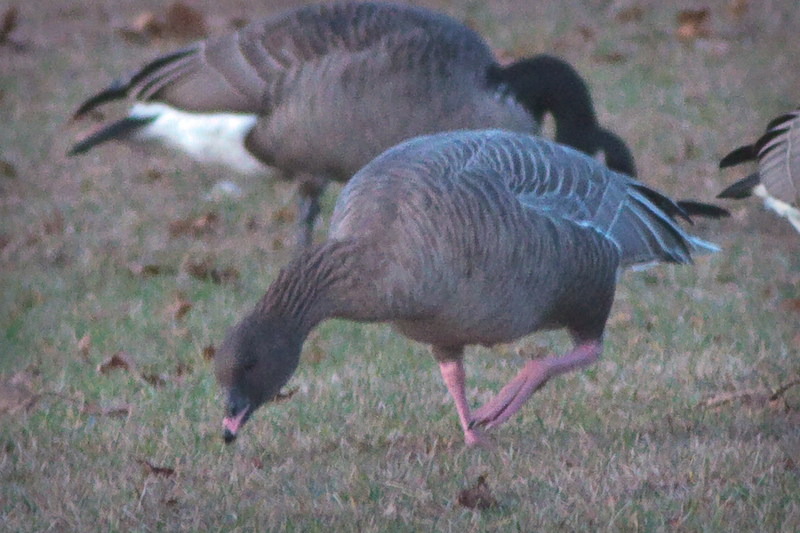 I noticed there were a couple of banded Canada Geese, but still no Pink-footed Goose or Barnacle Goose. I drove over to the golf course, but no luck there either. By this time, it was about 1:30 and I was getting a little peckish, so I drove to the nearest Boston Market for lunch. After lunch I drove back to Kings Park High School to scope it out once more. Still just Canada Geese though. Geese have a range of several miles from their roosting location, but I didn’t know the area very well. One obvious possibility was the Nissequogue River State Park. There were a few Canada Geese there, and a couple of Hooded Mergansers but nothing unusual. I drove along Old Dock Road, and checked the fields at the William T. Rogers Middle School. There were a few gulls here, but no geese. About 3 PM I returned to Sunken Meadow State Park. Often geese will return to the same roost at night even if they’re feeding somewhere else during the day. However the flock still just held Canada’s. I drove over to the golf course again, and then back to the east parking lot. In the inlet along the east parking lot, I found a Great Blue Heron, some Yellow-rumped Warblers, and some Gadwall, but still no unusual geese. I drove back to Parking Lot 1, and walked over to the nearby closed Parking Lot 2 to scope the flock one more time. Still just Canada Geese. I ran into some other local birders, who also hadn’t had any luck with the bird. By that time it was four o’clock in beginning to get a little dark. I called my wife and told her I’d be home in about an hour, packed up, got back in my car, and drove out of the parking lot. As I drove around the flagpole, I pulled off to the side to scan the flock one more time. That’s when I noticed some birders looking excited about halfway down the field. Could it be? I didn’t see any unusual geese with my binoculars, but I knew I’d feel really stupid if I drove off and then read on nysbirds that the goose had been reported at 4:05. I drove back into Parking Lot 1, parked the car, unpacked my scope, and walked back to the field. I got as far as the fence, and then started scoping the flock. At this point, the entire flock takes off into the air and heads west. However, as it takes off, I notice that one bird is a little bigger than all the other geese and, more importantly, it has two distinct white bars along its tailfeathers instead of just one! That’s the bird! A recent crash of Firefox 3.6 B3 Namoroka led to an unusual and annoying situation. My main Mac is a MacBook laptop connected to a large external monitor. When docked, I use the larger externally display is my main monitor. The menubar goes there and most of my attention goes there. However, Firefox started opening windows on the smaller laptop display that’s off to my left, and that I have to crane my neck to see. Here’s a troubleshooting tips it took me a few days to figure out. If Windows Vista reports your network printer as off-line and won’t print anything, but the printer will print just fine from other computers on the network, especially Macs, check to see if the printer picked up a new IP address from the DHCP server. Macs are smart enough to still recognize and find the printer even when its IP address has changed. Windows Vista PCs aren’t, and get seriously confused when a printer moves from one IP to another. If this is indeed what happened, you’ll need to delete the old printer from the printer control panel and add the printer as if it’s a completely new printer. I don’t happen to know how to retrieve or reassign any jobs still pending for the off-line printer. Minor user interface inconsistencies still annoy me, even in otherwise excellent products. Usually the problems I notice are GUI problems. However, recently I’ve noticed an audio user interface problem, this time in Dragon NaturallySpeaking. Why, oh why, do you put the microphone to sleep by saying, “Stop listening” but wake it up by saying, “Listen to me”? Obviously, the correct, parallel command is “Start listening”. And while I’m on the subject of Dragon NaturallySpeaking, why can I say, “Cap that”, but not “Capitalize that”? Don’t forget to update the time in your digital camera to account for the recent Daylight Savings Time shift. Cameras are not as smart as our modern computers and cable boxes. They don’t automatically update for changing to and from Daylight Savings Time. you also need to remember to change the time settings in your camera when you move between time zones. Otherwise, a few months later you can find yourself puzzling over photos of diurnal raptors that seem to have been taken at 3 AM in the morning. With and without flash, the images were crisp, sharp, and more often than not in focus. I was actually able to start choosing which images to keep based on composition and the interest of the picture. I no longer had to select only the one or two sharp images out of 100. For the first time, I was able to take super telephoto pictures that came out as sharp as the images taken with my hundred millimeter prime lens. You are currently browsing the Mokka mit Schlag weblog archives for November, 2009.